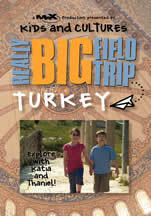 Learn about the fascinating country of Turkey in the first of our series of Really Big Field Trip DVDs. Great. Knowing Turkey from perspectives of kids is wonderful. Currently, only available in the U.S. Price includes media mail shipping in the U.S.
Can you guess what these signs mean? The Red Rose Intercultural & Educational Foundation is a non-political, non-profit, charitable and educational organization whose mission is to contribute making cultural diversity a source of richness and strength. The Foundation is providing logistical support. Kimse Yok Mu is one of the largest relief organizations in Turkey, with projects all over the world. Kimse Yok Mu coordinated the donation of the playset by HomePlace Structures to Lemanana Elementary School in Instanbul as part of our experience.